Note: Before proceeding, make sure you have the latest Service Packs and Windows updates installed. Also make sure your wireless adapter has the latest drivers installed. If your computer has a built-in wireless adapter, download the latest drivers from the computer manufacturer's website. If you have an external wireless adapter, download the latest drivers from the adapter manufacturer's website. 3. Tap or click the network icon, it should have "Available" or "Network" underneath the icon. 4. 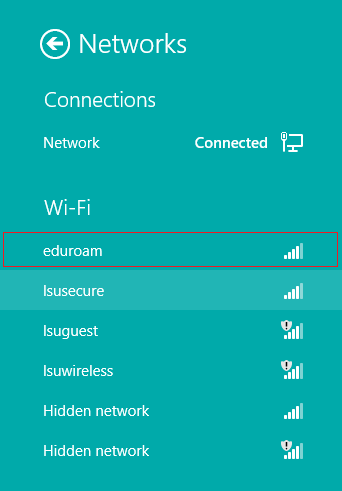 Select "eduroam" within the listed networks available for your device. It should be located under Wi-Fi. 5. Tap or click [Connect]. 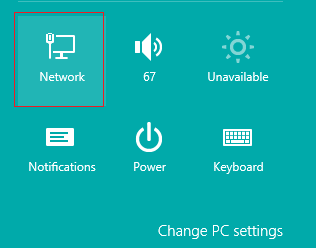 If you are using the network more than once then check the Connect Automatically box as well. This will connect you every time you are near the network automatically. 6. Enter in your PAWS ID @lsu.edu in the first field and your PAWS Password in the second field below. Enter your PAWS ID & Password in the form <PAWS ID>@lsu.edu. If you DO NOT include the @lsu.edu, you WILL receive an error message. 7. 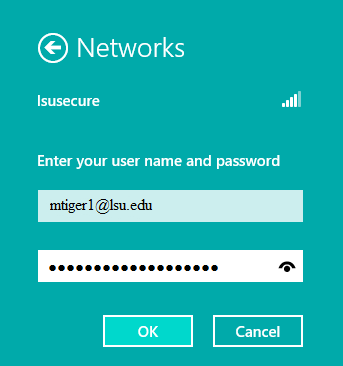 Press OK and Connect to complete the setup of the eduroam secure wireless network.